Nestled in the basement of the historic Crown Point Courthouse, in downtown Crown Point, Indiana is one of the best hidden gems in the region. 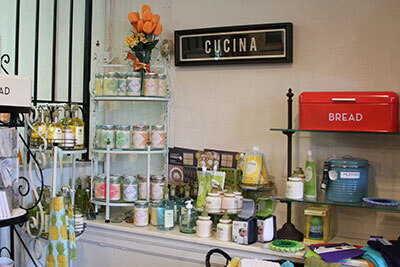 Mescolare is a boutique shop unlike any other in the area, featuring an array of different products and commodities such as cooking utensils, specialty foods and kitchen supplies. I recently visited Mescolare and was overwhelmed with how many amazing items there were inside the store. Whether it&apos;s a gift for someone you love or you&apos;re just looking for something new, Mescolare will entice your shopping appetite. While I&apos;m not much of an amateur chef myself, my girlfriend loves to cook and is always trying new recipes and kitchen gadgets. Mescolare has all that and more, which is why I&apos;m planning a special trip to take her to the shop. Of course, I&apos;ll admit I&apos;m a bit hesitant to show her the wonders of Mescolare because I suspect we&apos;ll leave with a whole truckload of stuff! There&apos;s just that much inside Mescolare that I know she&apos;ll love. Another great aspect to the store is that everything inside Mescolare seems to have a personal touch. Owner Cyndy Horn has selected each item to fit your culinary needs or introduce your taste palate to new flavors. Unlike big box retailers, Cyndy and her staff can speak to you about every item inside Mescolare and tell you why it&apos;s useful, how to use it and probably even give you a story on why it&apos;s in the shop. You don&apos;t get that sort of expertise in many places these days and that&apos;s why shopping local can be so rewarding. Speaking of local, Mescolare stocks a wide variety of locally produced items, from jellies and jams to salsas and dips. Those local food products allow you to get a fresh taste and phenomenal flavor that&apos;s produced right here in the region. Even the items that aren&apos;t created in Indiana are the types of things you don&apos;t find on your average store shelf. Everything at Mescolare has been cultivated to be the best, and every selection has a rare quality about it to make it stand out. This is not your usual assortment of items that can be found anywhere. Mescolare is the Italian word for mix, and there&apos;s certainly a eclectic mix of things to buy there, but the shop might as well be called "Joy", because it has an aura that just radiates happiness throughout. Every item is designed to either put a smile on your face or make your life a little easier. You can feel that the products you&apos;re buying at Mescolare will either be part of a fun get-together, or will be used to create a memorable moment where food, family and friendship converge. You can&apos;t buy moments like that, but you can buy the supplies to make sure those events go off without a hitch at Mescolare. So the next time you&apos;re in Crown Point be sure to stop in, or make a trip out to the Courthouse because it&apos;s worth it. You may not know what you&apos;re looking for when you enter Mescolare, but with gourmet spices, chocolates, mixes, pastas, gadgets, canisters, containers, bowls and so much more packed inside the shop, you&apos;re bound to walk out with something special. And while you&apos;re there, visit many of the other wonderful specialty shops located inside the Courthouse.